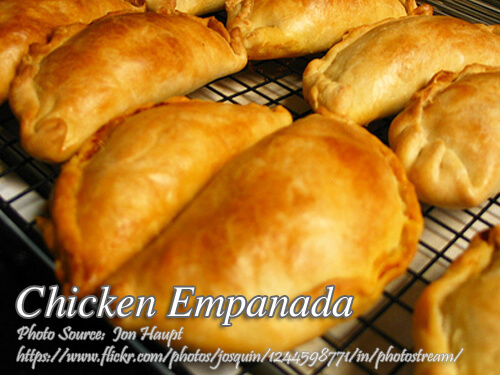 This is I think the most popular kind of empanada, the chicken empanada. Either you can bake this empanada or fry it if you don’t mind having a lot of grease in your meal. The ingredients are very basic and you only need chicken meat, onion, potatoes, bell pepper, curry powder, milk, ground pepper for the filling. And for the pastry you need flour, margarine, salt, water and sugar. Baking is preferred not only it is healthy because it is grease less, it is also more flaky when you bake it. Those are some advantages of baking pastries rather than frying. This is I think the most popular kind of empanada, the chicken empanada. Either you can bake this empanada or fry it if you don't mind having a lot of grease in your meal. Saute onion, add all ingredients except milk. cook for 5 minutes, add milk and cook for another 3 minutes. Cool. Then use this filling to fill in dough. Mix sugar, salt and flour. Cut in butter using a blender or 2 knives until it resembles coarse cornmeal. Sprinkle water and mix well with hand to form a ball. Knead lightly. Sprinkle flour on a board and roll out dough into ¼" thick. Cut using a round cutter (a medium sized saucer can be used if there is no molder. Place saucer up-side down on dough and cut with a knife). Then, fill each cut dough with 2 Tbsp. of sauteed fillings. Fold dough to form a half moon, press one end to the other. Brush with egg yolk or milk. Arranged on a greased baking sheet. Bake in a preheated oven about 350°F until the crust is golden brown. simple recipe and easy to learn.but pls indicate estimate number of servings of one recipe. Hi Josefina, please see the recipe again it says 5 servings. Hi Juvy, I think frying will not make the crust flaky compared to baking. Best recipe ever. I fried it my family love it. Hi V, I’m happy that your family loved it!